Santa’s Arrival, Christmas Tree Lighting and ELF Movie! You are here: Home / CBDA News / Christmas Celebration / Santa’s Arrival, Christmas Tree Lighting and ELF Movie! 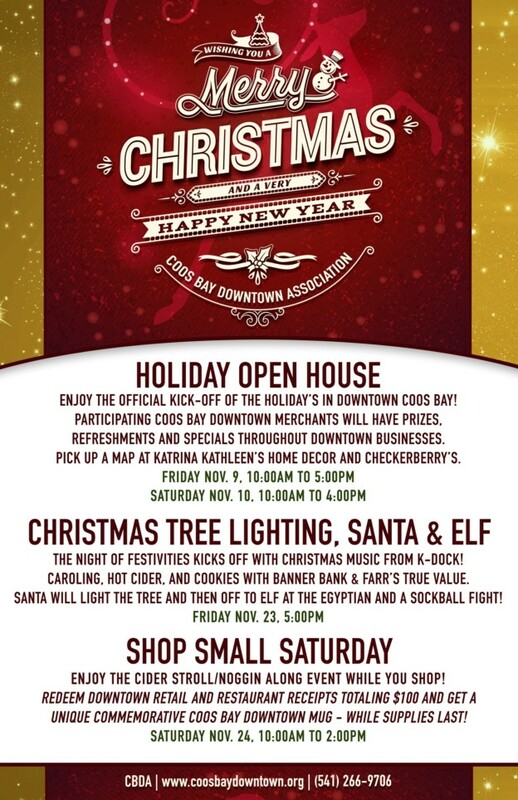 The Friday after Thanksgiving, the Coos Bay Downtown Association will help Santa get to Coos Bay and light Coos Bay’s Christmas Tree at the Coos Bay Visitors Center. Festivities begin in downtown Coos Bay around 5:00ish pm on Friday, Nov. 23, at the Coos Bay Visitors Center with music from K-DOCK and Christmas carols while waiting for Santa to arrive. Santa is scheduled to arrive at the Visitors Center around 5:30ish p.m. where the Coos Bay Mayor will greet him and help with the annual Christmas Tree lighting. Apple cider will be provided courtesy of Farr’s True Value and cookies courtesy of Banner Bank. From the Visitors Center, follow Santa over to the Egyptian Theatre for a photo opportunity with the kids around 6:00ish pm. A free showing of “Elf” the movie with Will Ferrell will start around 7:15ish pm. Visits with Santa and Friday’s showing of the “Elf” are sponsored by Banner Bank and South Coast Family Dentistry. All who attend are asked to bring at least one pair of new socks rolled up to be tossed at the movie screen during the snowball fight scene. All socks will be collected and donated to local homeless shelters. You can catch a second showing of “Elf” and participate in the Sockball Fight, free of charge, on Saturday, November 24th. Santa visits begin at 12:30pm and goes to 2pm, the movie will follow at 2pm. Santa heads back to his workshop but there will be a third free showing of “Elf” at 7pm on Saturday the 24th. *Please note that times around the arrival of Santa and lighting the tree are approximate. Santa has many children to visit, therefore he has requested some flexibility in his schedule. 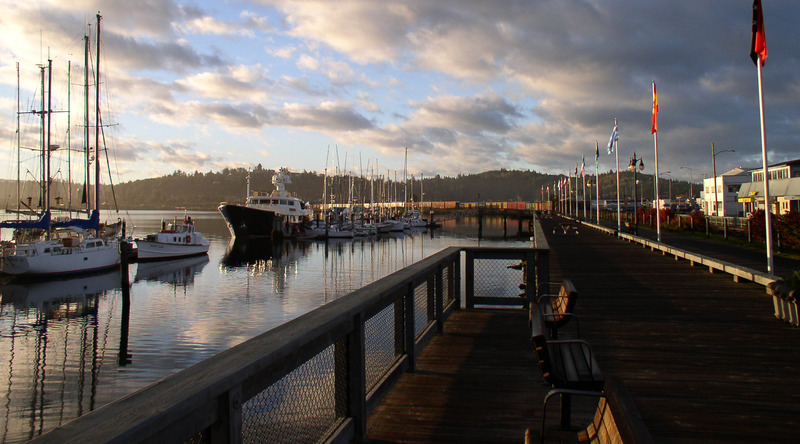 The Coos Bay Downtown Association promotes Coos Bay as an attractive place to live, work, and visit by continually enhancing the quality life of the downtown area.